The long awaited sequel Tom Wishon’s 1997 milestone book on clubfitting is now available. Common Sense Clubfitting: The Wishon Method brings clubfitting technology into the 21st century. Clubfitting technology has changed enormously since the 1997 publication of Tom’s previous book. Clubmakers need a more complete, and more up-to-date discussion of the knowledge and techniques that will match golfers with the best fitting specifications to enable them to get the most from their individual playing abilities. Common Sense Clubfitting offers the very latest fitting knowledge from the game’s most respected authority on custom clubmaking and clubfitting technology. Common Sense Clubfitting is a more streamlined, more accurate and more focused approach to teaching clubmakers how to make changes in golf clubs which will address the real game improvement needs of any golfer, regardless of their ability. Common Sense Clubfitting includes an in-depth section on how to identify the critical movements of the golf swing that indicate specific fitting requirements. The book also includes a completely new chapter on shafts, which will assuredly take shaft fitting from a “best guess” selection to a much more focused and individual process for ensuring the best choice of shaft for each type of golfer. Key to the common sense approach of the book to clubfitting is the completely updated spotlight on the exact fitting specifications which clubmakers must address to ensure the most significant improvement in the golfer’s shot distance, accuracy, consistency, trajectory and feel. — By explaining the real effect of each golf club specification on the game improvement goals of more Distance, better Accuracy, more Consistency, proper Trajectory and finding the right Feel for each golfer, Clubmakers will not waste time probing changes in the set which will have little to no game improvement effect. — In dialog form, Tom Wishon guides Clubmakers through an actual fitting session in a way that reveals how to acquire the information and process that information within the precepts of Common Sense Clubfitting to come up with the best possible set of fitting specifications for a golfer. — One by one, each of the specifications of woodheads is explained with particular attention to their direct and visible effect on shot performance. — As with Chapter 3, but for iron and hybrid heads, every one of the design and fitting specifications of this part of the set is discussed and pinpointed with respect to their direct effect on changing Distance, Accuracy, Consistency, Trajectory and Feel. — No one in the golf industry has spent as much time researching the performance and fitting of the shaft as Tom Wishon. Chapter 5 is truly a revelation in understanding in this so often confusing part of clubfitting because of the vast amount of modern and up-to-date information contained within. — Chapter 6 keys on the real effect of length, total weight, swingweight and the Moment of Inertia of the fully assembled club on the shot making performance factors of Distance, Accuracy, Consistency, Trajectory and Feel. 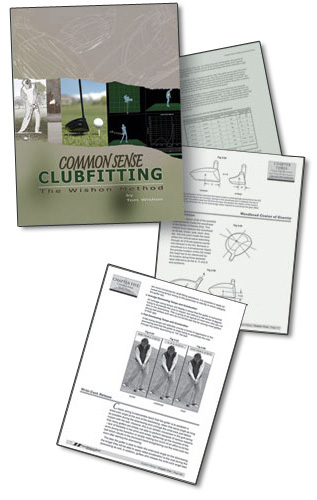 — Over 60 pages are devoted to this often forgotten, but so important part of custom clubfitting. Nowhere will you have the chance to directly affect the golfer’s score than with the information contained in this extensive coverage of proper short game fitting for all golfers. —Combining his swing knowledge and experience with his golf club design and fitting know-how, Tom Wishon illustrates and explains how specific swing moves directly affect or point to actual fitting requirements for golfers. Because of the importance of understanding how the swing affects the fitting recommendations, this chapter is of critical importance for Clubmakers to study. —Instruction in measuring clubhead specifications, fitting beginners and juniors, and advice about fitting devices and equipment is extensively covered in the appendix section of the book.